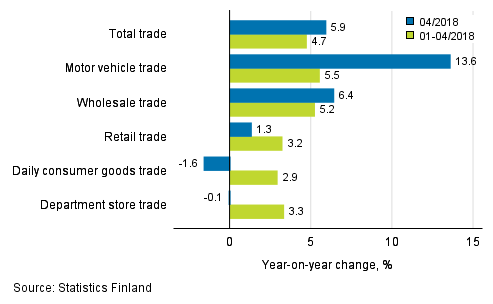 According to Statistics Finland, sales of total trade grew in April by 5.9 per cent from April 2017. Sales in motor vehicle trade grew most among the sectors of trade, altogether by 13.6 per cent. Sales of wholesale trade went up by 6.4 per cent over the same period and sales of retail trade, in turn, by 1.3 per cent. The growth in retail trade was affected by the positive development of specialised store sales, whereas daily consumer goods sales and sales in department store trade declined. Sales of daily consumer goods went down by 1.6 per cent and sales in department store trade by 0.1 per cent from April 2017. The sales volume in retail trade was 1.9 per cent greater in April than twelve months earlier. Over the same period, the sales volume in wholesale trade grew by 3.8 per cent. Sales volume in motor vehicle trade, in turn, grew by 13.6 per cent and thus increased as much as turnover in the industry. The sales volume of total trade grew by 4.5 per cent in April from April 2017. In the January to April period, sales went up by 3.2 per cent in retail trade and by 5.2 per cent in wholesale trade compared with the corresponding period of 2017. Sales in motor vehicle trade increased by 5.5 per cent over the same period. Total trade sales increased by 4.7 per cent from January to April 2017. The reported annual changes in trade sales and sales volumes are not seasonally or trading day adjusted, which means that the effects of public holidays are not considered. In April, the development of sales was partly due to Easter being at the turn of March and April this year, while last year it was in April. The fact that Easter occurs in different months is in particular visible in the sales development of food during March and April. ISSN=1799-0939. April 2018. Helsinki: Statistics Finland [referred: 21.4.2019].